Rockport and neighboring Texas communities are hit harder by the storm's wind than high water. Rockport, Texas: The wind was so intense here that Cathy Dever thought it was a tornado - one that never seemed to end. Dever fled her double-wide trailer and sought refuge in her neighbor's utility closet, clutching a small plastic bag that contained her son's phone number. If she didn't survive, she thought, at least she would be quickly identified. For hours she waited, flinching as gravel and debris slammed against the storm shutters. "It was so loud, you could hear it picking up rocks off the landscape," Dever, 59, said Saturday, just after Hurricane Harvey made landfall over this spit of land 30 miles northeast of Corpus Christi. As residents emerged throughout the morning, local officials and emergency responders across the region scrambled to assess the damage. According to initial assessments, Corpus Christi was relatively spared a devastating impact, although half of the city lost electricity and roofs were blown off some buildings. 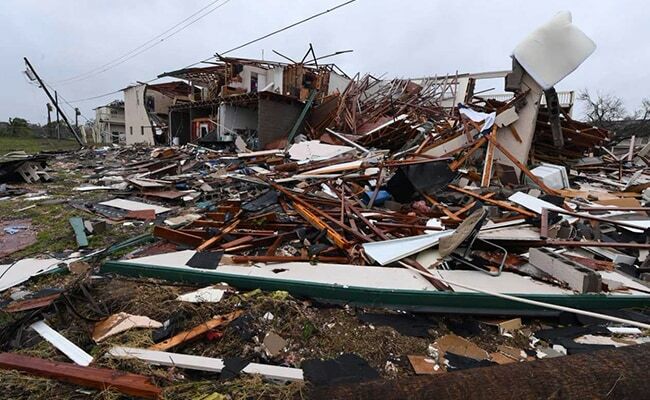 But in Rockport, as well as in the adjoining towns of Fulton and Aransas Pass, there were scores of damaged or destroyed properties across communities of mobile homes, middle-class houses and vacation retreats. The Category 4 hurricane tossed the mobile homes across streets and into neighboring structures, chewed through brick buildings, peeled off roofs and aluminum siding. At the entrance to the resort town of Port Aransas on Mustang Island, law enforcement blocked the road. "It is too dangerous," one Port Aransas police officer said. "The roads are collapsing, and there are downed power lines everywhere." Officers began conducting a search-and-rescue operation for eight people reported missing, according to an Aransas County sheriff's deputy. In Rockport, a town of about 10,000 residents, numerous buildings had collapsed, including several iconic structures in the beachy commercial district. The wind shredded restaurants and stores. Strip malls and hotels also suffered major damage. Yet the town and broader area appeared to escape the kind of catastrophic damage that Hurricane Katrina, which made landfall as a Category 3 storm, inflicted on the upper Gulf Coast in 2005. Despite predictions of a 6- to 12-foot storm surge, residents and emergency management officials here say that amount of water never materialized. What the hurricane lacked in water, though, it made up for in wind. The National Weather Service reported gusts as high as 132 mph at Port Aransas. Long before the eyewall passed over the area, the wind sucked the windows out of nearly a dozen Aransas County Sheriff Department's vehicles. Jimmy Kendrick, the mayor of Fulton, said he and several emergency management officials used an armored SWAT vehicle to try to escape from the wind. "You couldn't even see the hand in front of your face" in the wind-driven rain, said Kendrick, who lost the Sears appliance store he owns. Two school gymnasiums also were destroyed, he said. Phone, electric and gas service have been crippled throughout the area. Kendrick said it may be weeks before Fulton's evacuees can safely return. Those who refused to evacuate despite a mandatory order - about half the town's 2,000 residents - could face days of suffering until relief supplies arrive. And they're complicating rescue efforts. At a three-story apartment complex near Fulton, firefighters rescued a man after the top story pancaked onto the second floor. Kendrick said about a dozen people were injured there; many were treated at a makeshift hospital set up at the Aransas County Detention Center. Susan Stewart, 52, was wandering through deep puddles and navigating around downed power lines with her 31-year-old son, who has mental disabilities, as the two searched for food and cellphone service. Taylor said they didn't have anywhere to evacuate to on Friday so they stayed behind in their trailer. During the height of the storm, a tree crushed the porch. "But the trailer is still standing," said Stewart, who credited fellow parishioners at her Pentecostal church. They started praying for her when they heard she didn't evacuate, she said. "It was all night of slam, bang, boom, but the trailer didn't hardly rock." Mary Lee Grant in Port Aransas contributed to this report.